Blog of the Week: Carole & Co.
Carole & Co. is a blog about Carole Lombard and classic Hollywood. Naturally, it includes film reviews and biographical information about one of classic film's most revered actresses. It also profiles actors and actresses who worked with Ms. Lombard--from famous stars (William Powell) to lesser known supporting players (Louise Beavers). Carole & Co. recently participated in two entertaining and informative blogathons: For the Love of Film: The Film Preservation Blogathon and the CMBA's own Black History Month Classic Movie Blogathon. Carole & Co. can be found at http://community.livejournal.com/carole_and_co/. Click on the links below to view some of recent posts at Carole & Co. In her creatively-titled blog Skeins of Thought, Moira Finnie notes that she's "interested in cinema, the arts, and books....and tries to remind herself, and others, that when viewing this mad world, when it is dark enough, you can see the stars." Skeins of Thought includes classic film reviews, profiles of filmmakers and performers, interviews with authors who write about the cinema, and links to web sites of interest to classic film lovers. 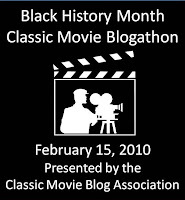 It participated in two recent blogathons: For the Love of Film - The Film Preservation Blogathon and the Black History Month Classic Movie Blogathon. Today, the CMBA is proud to pay tribute to Black filmmakers and performers as part of the Black History Month Classic Movie Blogathon.